The J-MUSIC Ensemble is an 8-piece instrumental band that is dedicated to bringing new perspectives to the world of Japanese music. 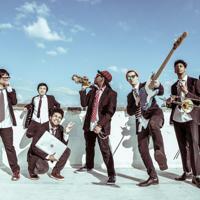 Featuring blazing brass melodies and chilling saxophone solos, this band fuses its background in jazz improvisation with the catchy and brilliant nature of modern Japanese music to create powerful new versions of J-Pop/J-Rock songs, anime music, and more! Some of the songs most notably covered and transformed by J-MUSIC include “Polyrhythm” by Perfume, “Simple And Clean” from Kingdom Hearts, “Crossing Field” from Sword Art Online, and “Tank!” from Cowboy Bebop, among other iconic staples! The idea was conceived by Grammy-nominated saxophonist, Patrick Bartley, who grew up hearing video game and anime soundtracks while simultaneously learning jazz and other American music styles, and had a dream to someday bring those worlds together. The dream now a reality, the J-MUSIC Ensemble has been featured at anime conventions, Japanese culture festivals, and on international television, and continues to put on captivating performances that entertain and educate all at the same time.